Living with a Green Heart Archives - Joelle Delbourgo Associates, Inc. Gay Browne is a Personal Environmental Health Advisor, Writer, and Founder of Greenopia: a comprehensive city guide of sustainable businesses to help consumers eat, shop, and live green. Greenopia was launched in 2005 as a print series for Los Angeles, San Francisco, and New York and rapidly expanded nationwide through Greenopia.com. Greenopia.com and its accompanying mobile app will re-launch in First Quarter 2019. Prior to her work with Greenopia, Gay enjoyed a successful 15-year career in advertising and public relations. Gay is a contributing editor to The Huffington Post and Thrive Global. She served on boards and is involved with multiple environmental and humanitarian non-profits and is working on her first book. She has a deep personal commitment to personal environmental health and helping people lead toxic-free lives. In her spare time, Gay enjoys hiking, yoga, meditation, art restoration, and her three children. 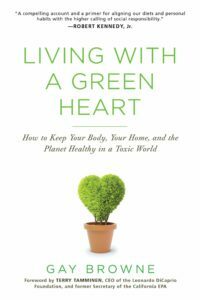 LIVING WITH A GREEN HEART: How to Keep Your Body, Your Home, and the Planet Healthy in a Toxic World (Citadel Press/Kensington, March 2019) is her first book.